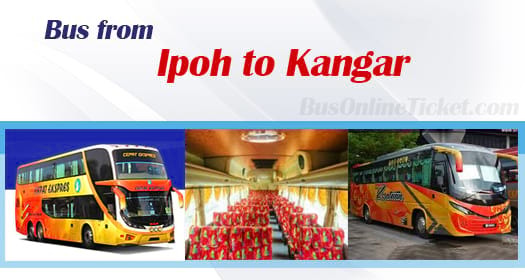 Bus from Ipoh to Kangar is one of the important and useful bus route service to connect people between the two cities. Please note that there is no direct train service or flight service available to allow people to travel between Ipoh and Kangar. Therefore, they typically rely on bus service from Ipoh to Kangar. Kesatuan Express and Cepat Express are the two reputable bus service providers offering bus from Ipoh to Kangar. Kesatuan Express offers up to 5 daily departures while Cepat Express provides 3 daily departures from Ipoh to Kangar. Both players are operating the bus service with comfortable VIP coach. The bus journey from Ipoh to Kangar needs about 5 hours depending on the traffic condition. At least one stopover will be given to the passengers for washroom or snack break. Please note that all the buses in Malaysia do not have toilet facilities on board. The bus ticket price from Ipoh to Kangar is reasonably priced in a range of RM 30.00 to RM 33.40 depending on your choice of bus service provider. Cepat Express offers child fare at RM 25.10 for bus service from Ipoh to Kangar. The boarding point in Ipoh is located at Aman Jaya Bus Terminal. People who live in Ipoh town area could easily go to Aman Jaya Bus Terminal by taking a 30 minutes public bus or taxi. The arrival point in Kangar is conveniently located at Kangar Bus Terminal. Everyone is advised to purchase bus ticket online in advance at BusOnlineTicket.com to secure your ticket before travelling. BusOnlineTicket.com is the most reliable, secure and user-friendly online ticketing platform to allow everyone to book their tickets anytime, anywhere and any places. Moreover, you can book your bus ticket via our mobile app which can be downloaded for free on App Store or Google Play.